Kenneth Schermerhorn told me that a good conductor can communicate with an orchestra, even when the musicians speak different languages. For him, that was often the case when he led the Hong Kong Symphony. Kenneth said that conducting is, "a musical language - it does not translate into words". 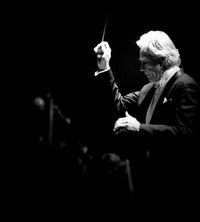 A conductor's language is, he said, "singing - mimicking..... singing at the orchestra, and they play it back". Kenneth was a master of leadership and persuasion. His orchestras played music the way he knew it should be played. And whether or not it was his intention, I found Kenneth Schermerhorn to be a bit of a poet. In an interview, I asked him to talk about the power of music..... to talk about what music does to our brains that can make us happy or sad -- that can make us cry, or sing, or dance. Here.... verbatim.... is what he told me 20 years ago. With so much of our kinesthetic equipment. We tend to do things in tempo. Is the great intrigue of it. About 12 years ago, I was in the Belle Meade Kroger late one night, and happened across Maestro Schermerhorn near the refrigerated meats and salad dressing section. Being a sophisticated and cultured man, he would -- I figured -- pick up some caviar, or truffles, or perhaps petit fors, or a rack of lamb. But no. He said, "I have a craving for sauerkraut." We chuckled, and he walked away with his jar of refrigerated sauerkraut. That night, at that moment, his words sang to me.... and I played it back. I headed to the cashier with my own jar of chilled sauerkraut.